I embossed the butterfly die-cut and stippled chalk ink onto it using the die as a stencil to add some color to the butterfly. Kind of a lot of colors going on it, but I guess that makes it cheery. This card is for Operation Write Home and was made as part of the “Things with wings” challenge. I think about half of the cards I make have butterflies! One remarkable thing that has occurred this week is that the Operation Write Home organization has now officially processed over ONE MILLION cards! This will be one of the second million that they ship out to the troops! Thanks for visiting. This entry was posted on Sunday, May 15th, 2011 at 2:59 pm	and posted in Challenges, OWH. You can follow any responses to this entry through the RSS 2.0 feed. Your card is very pretty, I like the Spellbinders butterfly. Thanks for playing in our challenge at Operation Write Home! Sweet card Yvonne. So soft and gentle. I finally got mine posted. this morning. 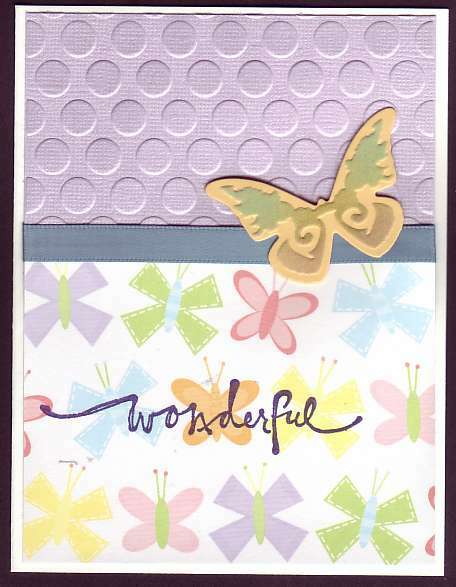 Very pretty paper and the embossing adds such wonderful texture, both in the background and the butterfly. Very nice!